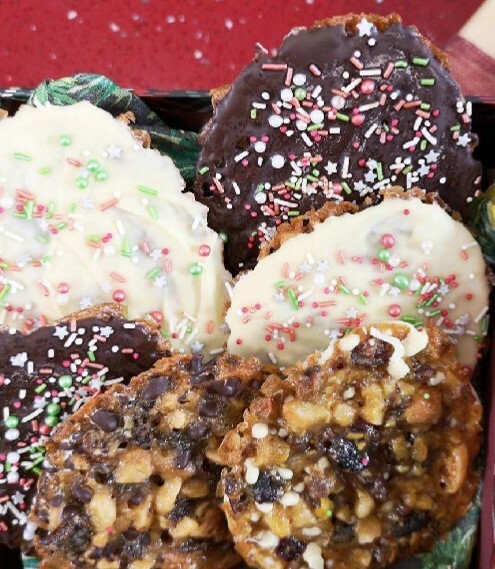 I had no idea that Florentines were so quick and easy to make. This will not help my addiction to these moreish, buttery bites! Aside from being a great way to showcase festive flavours, the small quantities required make these great for using up the last few grams from a bag in your cupboard or a spur-of-the-moment bake when you have unannounced guests. A neatly presented box of these would also make a rather lovely gift. Weigh butter, sugar, and golden syrup into a saucepan and heat gently until all has melted. Ensure that the sugar is stirred into the melted butter and syrup and remove from the heat. Add the flour to the melted ingredients and stir to combine. You do not need to heat the flour – I’m just saving you from having to wash up another bowl. Now comes the time to choose whether you are going to the dark side or the light side – whichever set of ingredients you choose, you will need to finely chop everything EXCEPT the chocolate which you should set aside for later. Stir the chopped ingredients into the saucepan. The mixture in your saucepan will make 12 Florentines. Use a pair of teaspoons to dollop mixture onto 2 lined baking sheets, 6 per sheet. Trust me, these will spread and flatten themselves out completely in the oven. Bake for 7-8 minutes until flat and golden brown. They may still be bubbling when you take them out of the oven but this is fine. Allow to cool for a few minutes before transferring the baking parchment to a cooling rack. Once completely cool, melt the Cacao Melts (dark or white) cautiously in a microwave. 30 seconds to start with then stir. I go in 20 second intervals after this and stop heating when only a few lumps remain as these will melt in the heat of the bowl. 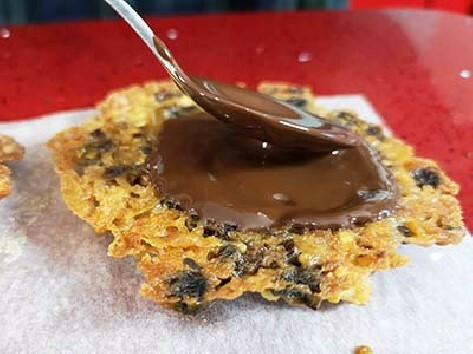 Flip each Florentine onto its face and spread its reverse side with melted chocolate and then sprinkle with festive sprinkles. Allow to set before packaging or devouring.